This incredible heatwave is certainly boosting our vitamin D intake, but what does all this sunshine mean for our skin? This summer has seen the hottest consistent temperature on record since 1976 – but, as we look to restore our wellbeing with some fun in the sun, we should also be mindful of how best to protect our skin from its detrimental effects. Investing in a broad spectrum SPF 50 sun cream that contains vitamin C and E (proven to repair the skin) is important – and remember to reapply regularly. With thermometers breaking record highs, do take extra precautions when it comes to maintaining your health, as well as, protecting your glowing skin. 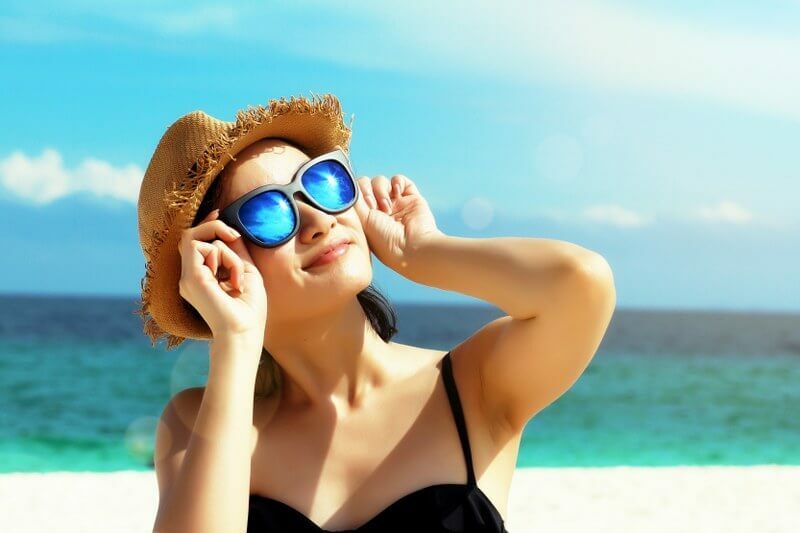 Nobody looks cool with sunburn but the incidence of skin cancer rising and, according to skincare experts the British Association of Dermatologists, many of us still haven’t ditched that desire for a tan. Here, at Intrigue Cosmetic Clinic, we suggest you limit your exposure to the sun. Whilst it may be tempting to lie out in it for long periods of time, UV rays are harmful so stay out of direct sunlight, especially during the hottest parts of the day. And, if the risk of skin cancer doesn’t alarm you, the ugly truth of this summer’s beauty aims is that sun exposure can also discolour our skin, affect its elasticity and reduce collagen production, causing wrinkles and premature ageing. It’s also important to keep hydrated to keep skin nourished. Drink plenty of water to ward off headaches and dizzy spells, as well as halt skin deterioration. Smoking and alcohol also impact negative on our skin health, so see this as a good reason to quit cigarettes and cut down on your booze, too. However tempting those summer cocktails might be, they wreak havoc on our youthful appearance. Try to limit those ice-lollies and ice cream when temperatures rise – sugar is not great for the complexion either – an insulin spike increases the production of skin oils and contributes to the clogging of follicles that trap oil and lead to break outs and inflammation that, in turn, breaks down collagen and elastin, resulting in sagging skin. As we sleep, skin repairs itself so get plenty of it by switching off from the digital world an hour before bedtime, keep your bedroom ventilated and don’t forget to use a night moisturiser. Skin dries out in these summer months and we see an increase in dead skin cells so it’s important to exfoliate your skin to keep it smooth and glowing. Dedicate time and effort to your home care regimen and consider booking a consultation with one of our specialists at Intrigue Cosmetic Clinic to a skin specialist who can advise a tailored programme of skin care treatments just for you. We also stock medical grade skin care products, such as the Obagi range, to improve the quality of your skin and iS Clinical cosmeceuticals and treatments that combine traditional botanical medicine with advanced technological formulation expertise to enhance the in-clinic results. Taking care your skin is a sound investment for the future you, so follow our tips and please browse our treatments to get the ultimate in skin rejuvenation and achieve that healthy glow safely.